Growing up the 4th of July brings back sweet memories of being with my family at my aunt’s pool. We would swim all day long and then at night we would wave sparklers and throw firecrackers out into the night. If we were lucky we could catch a few fireworks shows after all the fun. 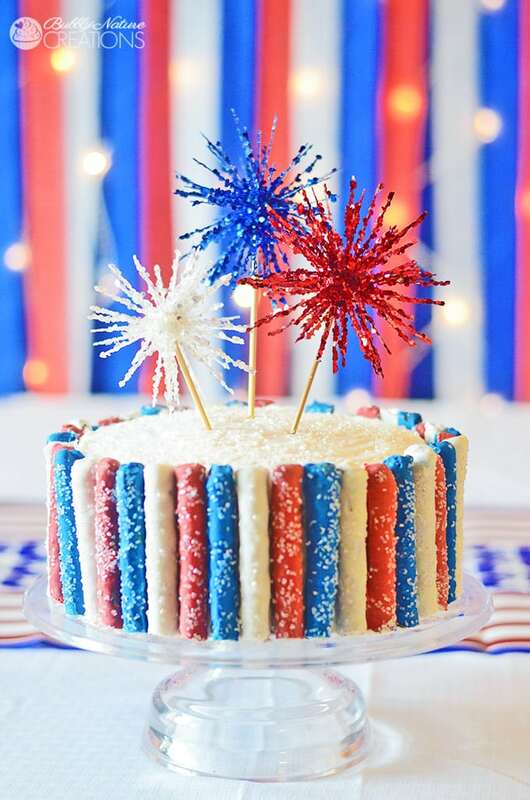 This 4th of July Sparkler Cake reminds me of the sparklers and fireworks! I found the decorations at Hobby Lobby and put them on sticks! I think the cake turned out spectacular! 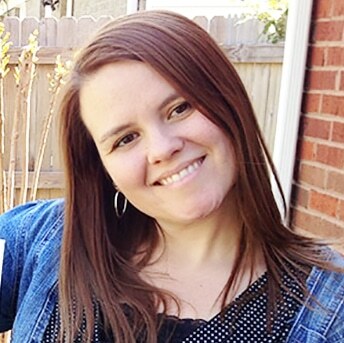 I made this cake with a simple cake mix then replaced the water with Nestle Coffe-mate French Vanilla Creamer! This made the cake so much more moist and rich! The sides of the cake are just covered with icing and white chocolate dipped pretzels that I colored red, white and blue then covered with shimmer sprinkles. Even the inside of the cake stood out because I made it look like camouflage! To see the whole 4th of July party click here! 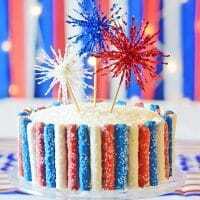 4th of July Sparkler Cake! Bake the cake according to the package directions in 2 8 inch round cake pans(If making it look camo then see the tutorial below first). Let the cake cool completely before decorating. 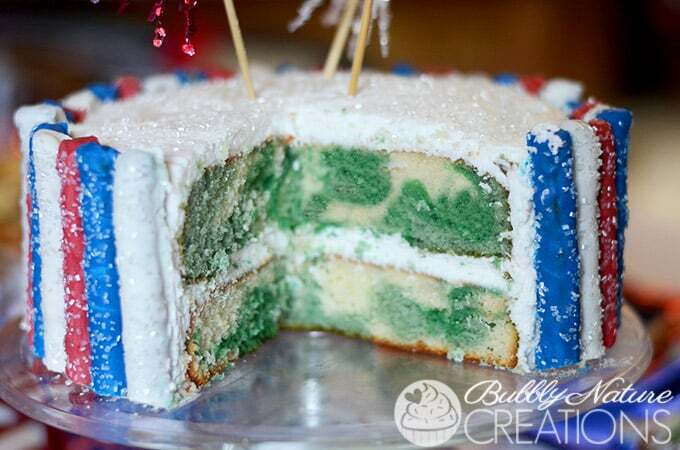 Ice the cake then place the covered pretzels around the sides in a red white and blue pattern. For the pretzel rod decorations I suggest making these ahead of time! I measured the circumference of my cake first and then lined up the pretzel rods and measured out exactly how many rods I would need to go around. I figured around 26 inches for an iced 8 inch cake. To make the pretzels you will need to work with one color at a time. Melt 6 blocks of the almond bark and either leave it white or color it with red or blue. Dip 1/3 of the rods with each color and coat them well and place them on wax paper to harden. Put sprinkles on the rods before they harden. Let them all harden before using them on the cake. To use them on the cake just press them into the sides of the already iced cake! 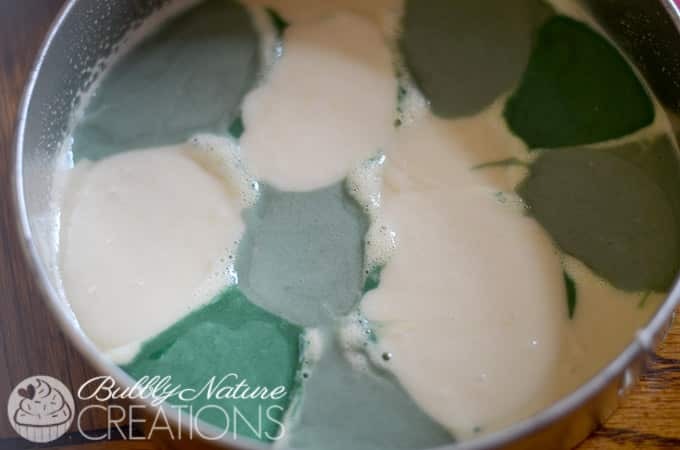 To make the inside of your cake Camo… Just Split the cake batter evenly into 3 bowls and use 11 drops of green and 3 drops of red in one bowl then one of the other bowls add 22 drop of green and 4 drops of red. Mix each bowl well and then take a spoon and dollop each color into the prepared cake pan. Keep putting these spoonfuls in alternating colors until you get to around halfway and then fill the other cake pan the same way. Then bake the cakes according to the package! Oh my gosh – this cake is just so PRETTY! I love the shimmery, sparkly pretzels around the edge and those fireworks toppers! woah, so pretty and yummy looking too! pinning and sharing! I’m wondering where you got the fireworks tooth picks? I want a sparkler cake but without the fire and these would be perfect! The inside of the cake looks moldy and not appetizing. I think I’ll stick with the red, white and blue colors. The outside looks beautiful though. Thank you for the idea.